How Much Water do Annual Flowers Need? 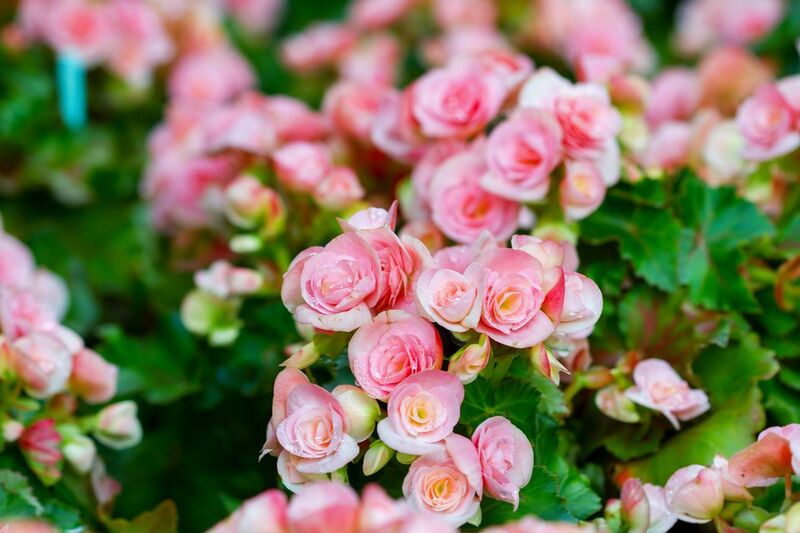 All plants need water, but since annual flowers tend to have shallow root systems and we expect them to spend almost their entire life blooming repeatedly, they need extra care. If they get stressed, they will either rush to set seed and not bloom again or slowly die. You can't really set a schedule for watering plants. Even if you have a drip irrigation system, you'd be wise to have a timer that can detect if it is raining. There are several caveats to factor in, but you should find a good balance if you follow a few simple guidelines to finding the right amount to water. If it rains, you might not need to water. However, it needs to be a good soaking rain, not just a sudden shower. And if the soil was hard and dry before the rain, it probably ran off before enough of it soaked in. Check at least 2-3 inches below the surface, to make sure the soil around the plant roots actually got wet. Other weather factors to consider are sunshine, heat, and wind. The soil will lose less moisture if the sky is overcast, but on sunny hot days, the soil can bake. Mulching under the plants will help keep the soil cooler and hold in moisture longer. Wind is an often overlooked element, but it can desiccate leaves and even dry the soil. Plants in windy locations, including on rooftops and near roads, may need more water than plants in sheltered locations. Sandy soil drains quickly. You could get a downpour in the morning and the soil will be dry by the afternoon. Conversely, clay soil holds onto moisture and should not be watered again until it has sufficiently drained. However, overly dry clay will take awhile to begin absorbing water. The initial water will roll off, like watering a brick. You will need to really soak hard clay before water will penetrate. The way to improve both sandy and clay soil is to incorporate lots of organic matter, like compost, leaf mold or well-rotted manure. Organic matter lightens clay soil and helps sand retain moisture long enough for plant roots to access it. But organic matter continues decomposing in the soil and is used up by the organisms that live there, so this is not a one-time fix. You will need to continually amend your soil with it, every year. The best time to do this is before you plant your annuals or when you are swapping out spring and summer annuals for a fall garden. Add a 2-4 inch layer of organic matter to the surface and turn it in or simply let it get worked into the soil and you dig holes for the plants. Any plant grown in a container will dry out quickly and annuals, with their shallow roots, will need water pretty much every day. Again, test the soil 2-3 inches below the surface. If it is dry there, it is time to water and that could be more than once a day. Mulch, even in a container, can make an appreciable difference in water retention. Annuals planted in flower beds may not need as much water as those in containers. That, of course, depends on how well draining the soil is and how much competition for water they are receiving from other nearby plants. Newly planted annuals will need extra water as they become established, but once they are growing and flowering, you may be able to get by with watering once or twice a week. It all depends on the other considerations listed here. Finally, how much you'll have to water depends on the plants you choose. Drought tolerant annuals, like zinnia, marigolds, and cleome, will require minimal watering; once a week will probably be fine. Others, like snapdragons, alyssum, and Impatiens, need regular water or they will suffer stress. Your plants will be the best indicator of when to water and whether you are giving them enough water. When annuals don't get enough water, they can start to look pale or dull and they are quick to wilt. If they are wilting during the day and reviving at night, you can be pretty certain that they need more water during the heat of the day, more mulch or a shadier spot. Unfortunately, the signs of over-watering are similar to under-watering; pale leaves and wilting. You'll be able to determine which it is by pushing your finger into the soil and checking to see if it is soggy or bone dry. Then make adjustments in your watering routine as needed.